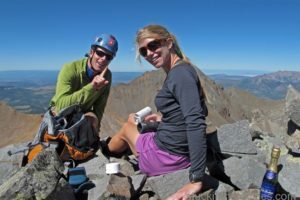 A couple of weekends ago Christy and I climbed Casco Peak and French Mountain, 13,904 feet and 13,940 feet respectively, and in doing so put Christy just five peaks shy of reaching the summit of the 100 tallest peaks in Colorado. 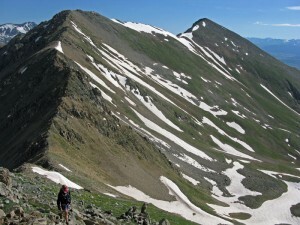 LaPlata Peak, 14,336 feet, the North Face couloirs still holding plenty of snow and the long Ellingwood Ridge climbs to the summit on the left. 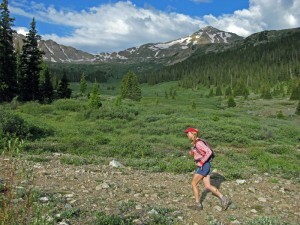 Located behind(west) Mount Elbert, we started from a camp in Halfmoon Creek. This tour has an easy approach, lots of time up high and is a fun day of peakbagging, like we used to do more regularly a few years back. 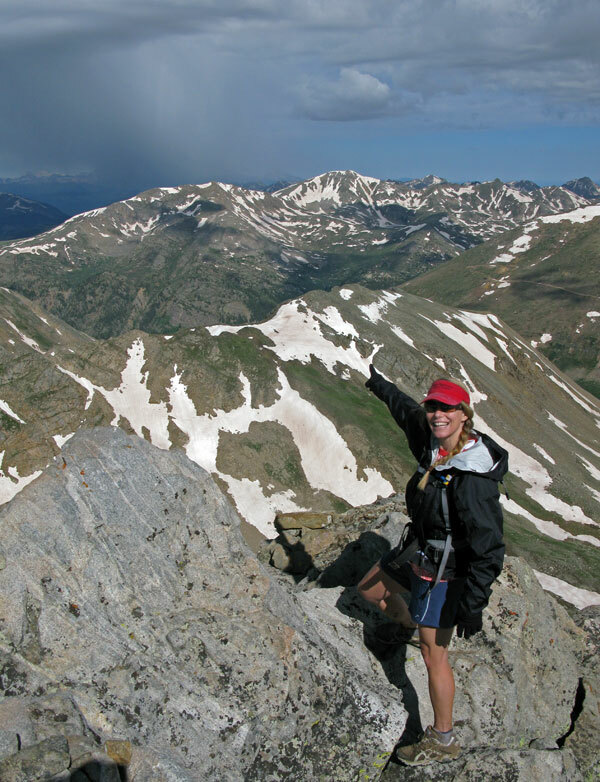 And because these peaks are just shy of the 14,000 foot mark, you’ll likely have them all to yourselves. 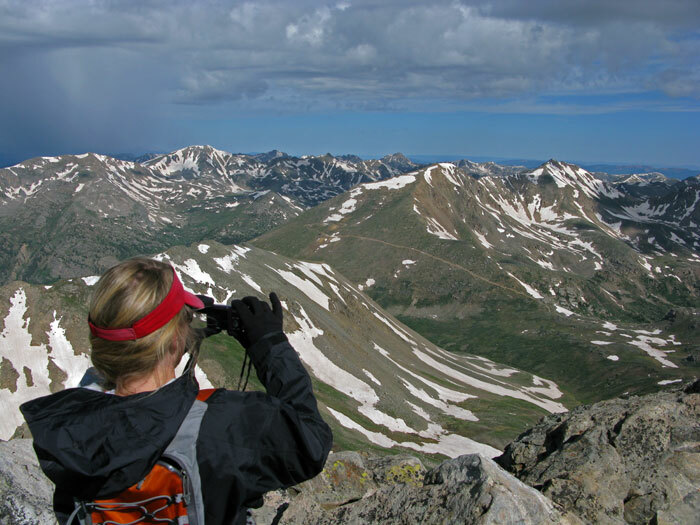 From the top of Casco you feel to be triangulated between three of the four tallest peaks in the state, Elbert, Massive and LaPlata, which typically record double or triple digit summiters on a weekend day, whereas the most recent visitors we read of in Casco’s summit register were here about two weeks earlier. The road up to the mine is easy for hiking, jogging or mountain biking, and Casco Peak can be seen in the background, on the right. From the trailhead, first cross North Halfmoon Creek which as Christy will testify, was the crux of her day. It’s a cold proposition early in the morning. 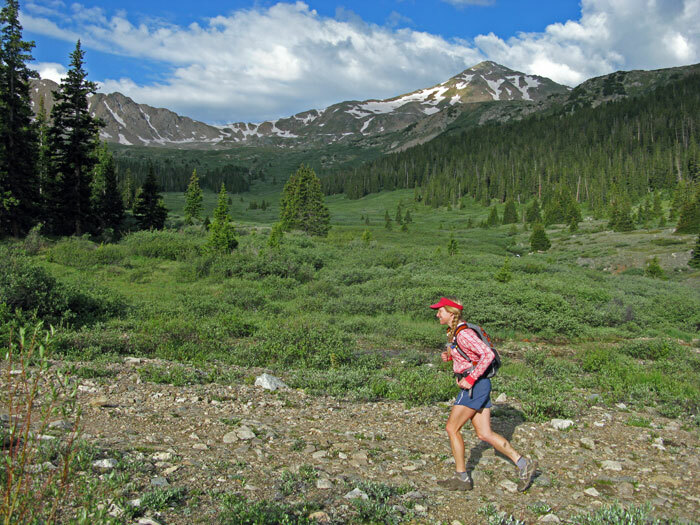 Once past, hike (or run) an old miners road up the valley for about four miles to near its obvious end, above treeline and near the “Iron Mike” mine. At this point you can pick any reasonable looking line up to the long ridge between the peaks and tag some summits. There’s no defined trail to the ridge. The entire day’s difficulty stays in the Class 2 range (steep hiking) with a short bit of loose stuff along the ridge in one section and a small amount of snow still present in another. 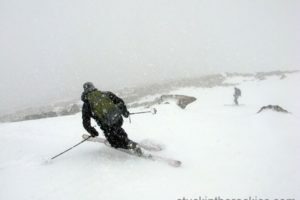 With regard to the snow cover, these pics are from early July. En route to Casco’s summit, Frasco and French (l tor) can be seen behind. The section up to Frasco stays in the shade on the left of the ridge and is the only part of the day that requires any attention insofar as staying on route goes. We started up towards Casco first, the slightly more technical of the two summits. Both peaks look as if they would be fun ski descents and we had long talked about getting in here in the spring to hit them in that fashion, but the plans have unfortunately been repeatedly bumped down the list, in favor of other ski goals (usually on their slightly higher 14,000 foot family members). Someday. T-storm, 11 o’clock. Going “light & fast” today meant we had little extra stuff with us. Thankfully this storm cell passed to the south. Anyway, after taking in the views from Casco, which are outstanding in a 360 degree sense and actually better than from it’s higher neighbors, we retraced our way back down the ridge to the saddle and starting following some faint trails towards French. 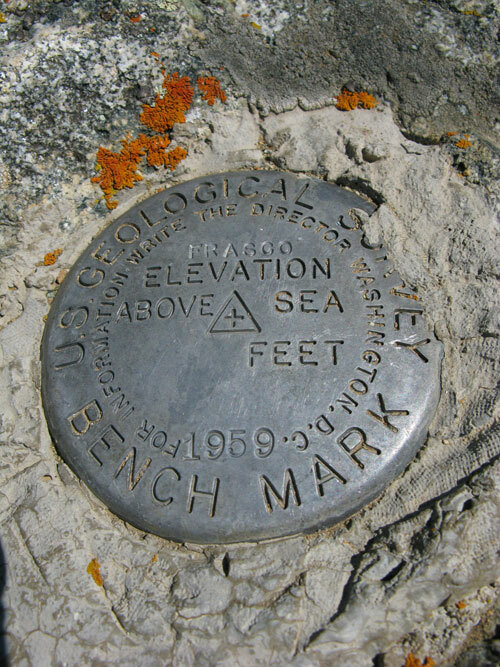 Along the way was an unofficial summit called Frasco Benchmark, around 13,900 feet but without enough independence, or “power,” to be considered a separate peak from French. 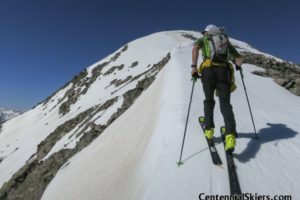 For anyone wondering how that little tidbit of what counts and what doesn’t is reached, according to the “rules,” for a peak to be “official,” its summit has to rise at least 300 feet from the saddle it shares with its higher neighbor. 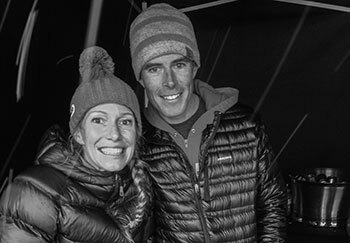 I believe it’s the Colorado Mountain Club that established this standard. If a peak, bump or ridge fails to meet this criteria, it’s considered to be part of the higher neighbor and not a distinct, or “official”mountain. Silly as it may sound, it’s necessary to have a rule such as this or else every small bump on every ridge would be considered a distinct mountain. 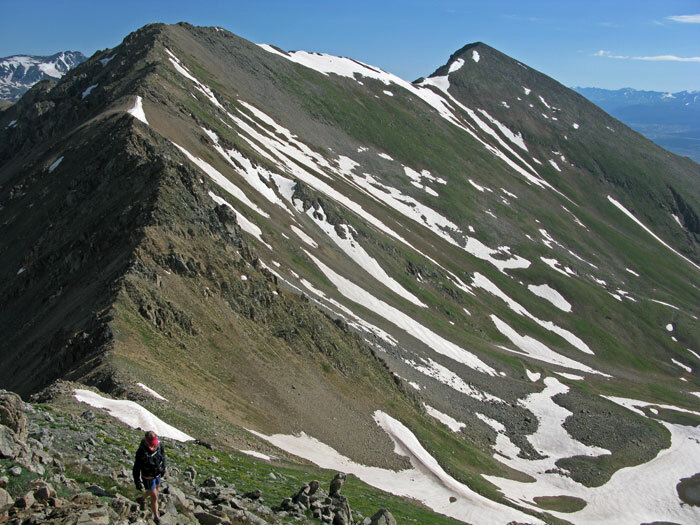 For Colorado, it usually works well as rule, as examples of Grays and Torreys, Oxford and Belford, Shavano and Tabeguache and the Crestones come to mind as representing separate peaks. Elbert & South Elbert or North & South Eolus don’t pass the 300 foot test and therefore are only considered subpeaks of the higher neighbor. The rule applies to neighboring summits of all elevations and aren’t exclusively applied to 14ers. Nearing French’s summit, sans piolet. 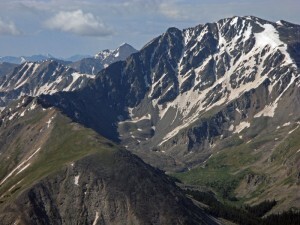 Mount Elbert’s backside can be seen to the right. From French we descended directly down the grassy slope back down the road and then cruised down to the truck from there. 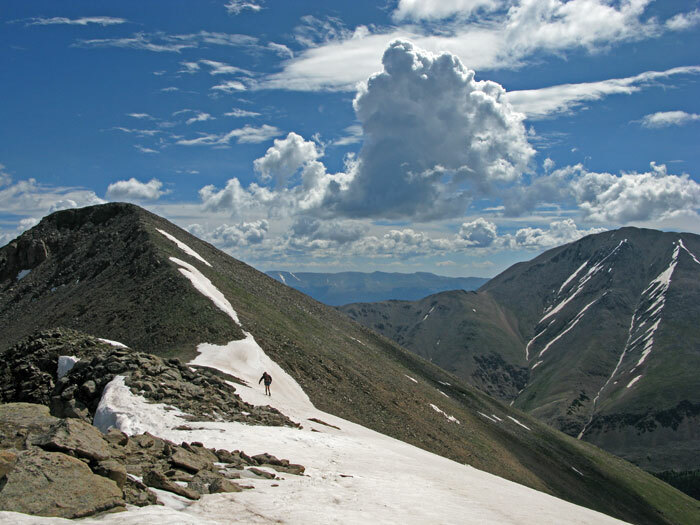 Three summits, two official Centennial Peaks, one airy ridge, 11 or 12 miles round trip distance and about 4600 vertical feet gained in a day where we could see several groups milling around the summit of neighboring Mount Elbert, but where we only saw a few marmots. It was fun. Go check it out. 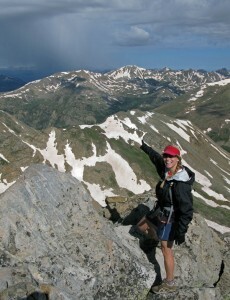 Emerald Mountain – 13,904 ft.
Next up on the ski list was Emerald Peak, 13,904 ft., another Colorado Centennial.